Those giant chess set are designed for outdoor use. They prepare for you who want to enjoy outdoor chess game without worry about its durability, because we choose the best quality of Teak wood as its main material. 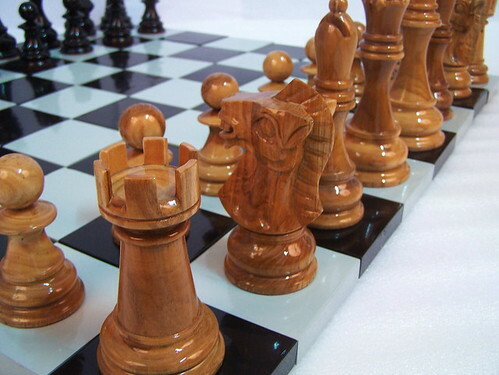 We all know that Teak wood is the strongest wood in the world, so we not doubt to use it for our chess product. Those are polished in black and brown, the ordinary color of a chess set. Add with glossy touch to make it looks elegant. Look the board also. The flat board also made carefully by those craftsman and painted in white-black squares. This wooden chess board has completed your outdoor chess game. You just need flat area for lay the board and put the pieces on it. Have an interesting outdoor chess game now! Get the unique, durable and beautiful giant chess set from us!